Weave down the slopes of Maui’s Haleakala Crater through shimmying palm trees and sugar cane, ecstatic in the wind, to acclaimed Surfing Goat Dairy. You may be surprised to find German expats Eva and Thomas Kafsack tending their goats and producing Certified Humane, gourmet cheese and chocolates on these 42 acres overlooking the sea. The Kafsack’s moved to Maui from the German Island Sylt in the North Sea over a decade ago. Sylt hosts a world competition for windsurfing, yet Maui’s world famous windsurfing tempted the adventurous duo to relocate. The Kafsack’s make their artisan cheeses daily from freshly pumped milk. The Certified Humane production does not use growth hormones, antibiotics, preservatives or hidden ingredients. The pastures are organic. 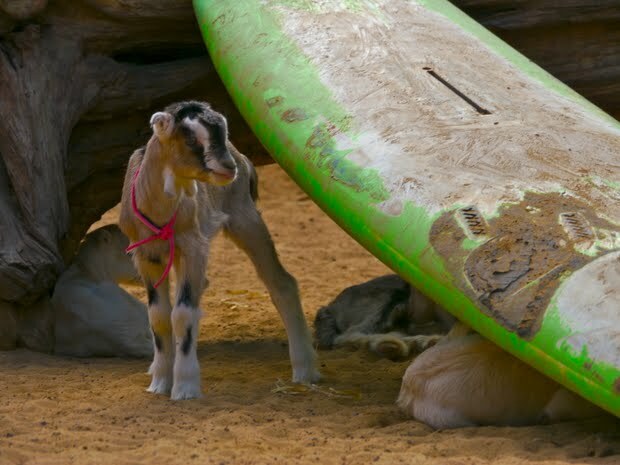 Surfing Goat cheeses have received eighteen awards in the past three years from various associations such as the American Dairy Goat Association and the American Cheese Society. This entry was posted in Food Warrior Interns, In the Pantry (food artisans) and tagged carrie stiles, food warriors, goat cheese, Real Time Farms, surfing goat dairy. Bookmark the permalink.